← Who Loves Animal Stories? 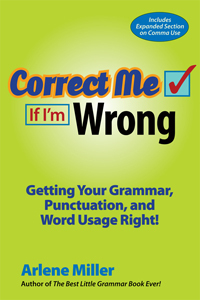 CORRECT ME IF I’M WRONG by author ARLENE MILLER offers the reader a second look at learning and understanding (American) English grammar. Miller is the undisputed queen of teaching grammar through the simplest methods. The book is not burdened with excessive examples or long paragraphs. Miller tells it in easy to understand language and often uses humor to help the lessons sink in. A MUST HAVE book for any writer or reader. I also recommend her first grammar book, THE BEST LITTLE GRAMMAR BOOK, EVER! I keep both of her books on my shelf right next to my copy of Strunk & White’s Elements of Style. This entry was posted in authors, California Writers Club, reading, Writers and tagged books, California Writers Club, writers. Bookmark the permalink.